With such memorable keyboards as the Casio SA76, Casio was once known as the company that made toy keyboards. And maybe with hindsight, it deserved the tag. But slowly this brand is redeeming its image. You only need look at the Casio PX-130 to see how. If you’re one of the skeptics and are consequently, doubting the PX130, you’ve come to the right place. In our review today, we’ll be presenting you the facts, so you make an informed judgment call for yourself. From the quality of its keys, to the built-in tones, we’ll show you areas where Casio did it for us. And also, areas where we’re less than impressed. 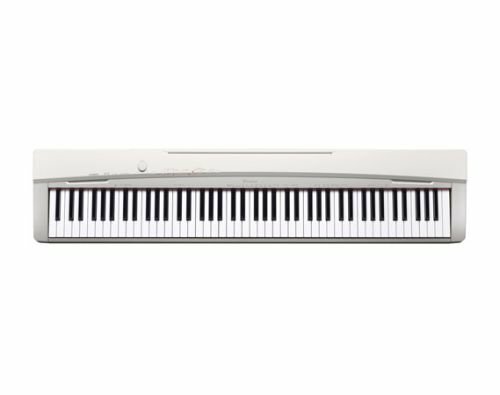 The Casio PX-130 is an entry-level piano best suited to beginners. First of all, this piano belongs to Casio’s Privia series which means that it is portable and compact. It will fit into any space easily and even add some oomph to the space, because this piano looks good! The sound quality is good, as close to an acoustic piano as Casio could manage for the price. You’ll also find that this transitions, from soft to powerful relatively smoothly. The keys feel great too and come with Casio’s Tri-Sensor Scaled Hammer action. So, they do feel like an acoustic piano in some sense, Casio even gave them simulated ivory keytops. So, there’s none of that plasticky feel that most digital pianos have. There’s a split/layer mode, plus a duet mode. And there are 16 built-in tones with different sound effects including the Acoustic Resonance DSP. Altogether, this is a fantastic entry-level piano. So, we recommend this for beginners. Pro players will definitely need more. But if you’re starting out and looking to get a quality keyboard, this makes a fine choice. In the bottom-line section of this review, we did mention that the PX-130 is for beginners. So, as you go through the features, keep that in mind. We repeat, it is not for pro players. As a beginner, you’ll probably be going from practice to home a lot. Or you might be staying in a dorm and therefore, cannot afford the space for a really heavy, space-consuming unit. And that’s where the PX-130 shines. It is compact and portable, making this keyboard up to the task for convenient storage and portability. However, what impresses us immensely, is how Casio still manages to deliver on major features. Check it out. The keyboard comes with 88 piano-sized keys. So, you don’t feel like you’re playing on a toy. It’s also important in building correct piano skills. And yet, it is compact enough to rest on a desk in your dorm without making your roommate call you a space hogger. And despite all this, this keyboard still weighs a mere 25 pounds. So, carrying this will never be a problem. And it’s not just about weight, the depth of a keyboard, is also very important in determining, whether it will be awkward to carry a piano or not. This measures at just 5 inches. So, it’s going to feel like carrying a textbook, except for the length of course. And, of course, we’re not going to forget that this piano does look good and you’ll be proud to own it. We like how Casio makes the interface of this keyboard very intuitive and easy to navigate. And that’s because there are quite a number of features and functions on the PX-130. So, it’s only right that navigating is easy. Interacting with a digital piano should never be difficult. Anyhow, the control panel resides just above the keybed. And you can even use the keys as a shortcut to select the functions you want every time. This seems to be a trend with piano makers these days. And we are loving it because it just makes things a whole lot more convenient for all involved. In all, the layout of this piano looks clean, well thought out, intuitive, and easy on the eyes. And this is important because you don’t want to scare beginners off with too cluttered a layout. We did tell you that this is for the beginners, right? Now, here are a few of the ways Casio looks out for beginners on this keyboard. First off, the Casio PX-130 comes with 60 demo songs. And why are demo songs important? Well, for two reasons actually. Demo songs are there for entertainment. You know, after a long day of practice, you can just kick back and enjoy some demo songs. Well, to be honest, we know you’d rather just listen to your own playlist on your phone. But hey, if you ever develop the hankering for some beautiful demo music, they will be there for you. lol. Next, and far more importantly, demo songs are very important in improving how well you play. They give you something to practice with on your own, even when your tutor is not around. Now, unlike Yamaha, the Casio PX-130 does not come with a learning suite. So, you’d either have to take online piano lessons or get a tutor. But, at least, you can use these demo songs to enhance your playing and have productive lessons. It also features a duet mode. This means that you and someone else can play side by side on the same keyboard. So, that someone else can be your tutor. Being straight up with you. There’s only so much an entry-level piano can do in terms of delivering a sound close to that of an acoustic piano. And, whenever you see a company making an effort, you’ve got to commend it. So, fair play to Casio, for an entry-level piano, this does a pretty decent job. It might not be a Korg but you can’t deny the quality at work here. Casio uses a Linear Morphing System as the sound engine and it works well. It sourced the samples used for this piano from its concert grand under four different key pressures. And to smoothen it all for beautiful continuity, Casio uses what it calls morphing technology. In the end, you get smooth transitions from soft pianissimos to powerful fortissimos. We must add here that it is quite difficult to achieve such a smooth transition on a digital piano. But it seems Casio has worked a miracle here. It’s amazing! 3 Grand Pianos: Classic, Modern, and Variation. 4 organs: 1 Pipe, 1 Jazz, 2 Electric. Now to the sound effects, you’ll find the chorus, reverb and the Acoustic Resonance DSP which should help you dress up your tones and give them a bit of oomph! All digital piano makers know that, if you’re going to make a digital keyboard feel, even remotely close to an acoustic piano, then you need hammer action. Yep, you’re going to have to put some tiny hammers into your digital keyboard. And yes, it will make your piano somewhat heavier but it seems they’ve found a way around that because many lightweight portable keyboards now come with hammer action. Just ask Yamaha. And you also have to make the action graded. This gives you a heavier feel on the low end and the lighter feel on the higher end just like what you have on an acoustic piano. Does the PX-130 deliver on both? Of course, it does. But here’s the icing on the cake – the ivory and ebony keytops. It’s what makes this keyboard feel great to the touch without feeling plasticky. Now, in all honesty, they might not feel as good as those found on the Casio PX-160, as those who have played it will know. But they are by no means bad either. They actually feel really nice. And here’s something else. Because of the ivory/ebony keytops, even if your hands get moist from a prolonged practice, they won’t start to slip off from the keyboard. Can connect to an MIDI controller or computer thanks to the USB port. Keys feel good to the touch with a nice response. Does not come with any on-board learning programs. Features only one USB port. Now for the techies among us who need more detail, here are the specs of the Casio PX-130. 88 keys with Tri-Sensor Scaled Hammer action. Keys come with 3 level touch sensitivity. Sound engine: Linear Morphing AIF. Modes: Split, layer, and duet. Sound Effects: 4 Reverbs, 4 Choruses, Brilliance, DSP Acoustic Resonance System. Connectivity: 2 headphone jacks, 1 damper pedal jack, 3-pedal unit connector, Type B USB port. 2 speakers: 13 x 6 centimeters, 8W + 8W. Dimensions: 52 x 11.3 x 29.9 inches (with stand), 52 x 11.3 x 5.3 inches (without a stand). Weight: 46.7 pounds (with stand), 24.7 pounds (without stand). This is a great piano for the beginner looking for something that feels close enough to the real thing. It works in any space and you can even play this on a bus or a train, if you fancy, because of its size. Plus, it’s definitely good to know that it’s kind on the pocket as well. Altogether, not a pro-level piano, but great job for an entry-level piano all the same.